Lifestyle: During these years many people moved from the country to the city. England reached a 50/50 balance around the 1850s. America’s equilibrium occurred around the 1920s. This industrialization caused the creation of new building types. Government: During the late eighteenth century, the Western world experienced two massive revolutions—the American Revolution and the French Revolution. Monarchies declined in power, and democratic governments were created. Patronage: Religious and aristocratic patronage gave way to more commissions by democratic governments and wealthy, self-made individuals. Technology: Advancements were made in building materials, transportation, and machinery. Traditional materials such as brick and stone were replaced by ferrous metals (iron and steel) and glass. Architects and designers attempted to mitigate their training with the demands of modern life—evidenced not only—in architecture itself, but also in architectural texts, interior designing, excavations, and urban design, some of which will be covered in this lecture. Advancements in these categories ultimately put the building profession irrevocably on the path towards twentieth-century modern architecture. Show your class a slide containing images of iconic works of Baroque and Rococo architecture. I like to use Borromini’s San Carlo alle Quattro Fontane (Rome, 1638–41) as the Baroque example and Germain Boffrand and Charles-Joseph Natoire’s Salon de la Princesse, Hôtel de Soubise (Paris, 1736–9) as the Rococo example. Describe the formal characteristics of Baroque and Rococo architecture. Describe the dominant ideologies and values of the cultures that produced these works. To what sources did they look? You students may be surprised to learn that the flamboyant qualities of Baroque and Rococo architecture that they learned to recognize and appreciate in previous lectures came under fire in the mid-eighteenth century for their perceived abuses of freedom—combining Classical elements in unorthodox ways—and invention, such as the creation of new capitals. Looking at these works from a second-half-of-the-eighteenth-century standpoint serves the dual purpose of acting as the segue from last lecture to this one and also setting the architectural stage for the current lecture. Francesco Borromini’s (1599–1667) San Carlo alle Quattro Fontane is a one example of a Baroque building that—to mid-eighteenth century minds—incorporated too much invention. Constructed for the Spanish order of Discalced Trinitarians, Borromini’s ground plan indicates that the interior space of the church was based on geometry (equilateral triangles, circles, and an oval). The underlying geometry becomes lost among the aspects that mesmerize viewers: the undulating walls, irregularly spaced columns, frequent wall openings, and ornament—all showcasing the freedom with which Borromini used and altered Classical elements—a significant example being the volutes of the composite capitals, some of which curve upwards instead of the traditional down. The sculptural quality of the interior is reflected in the church’s exterior. The façade swells out and in, and areas between columns are filled with niches and sculpture. Moving forward a hundred years to the Rococo, your students will likely be familiar with Germain Boffrand and Charles-Joseph Natoire’s Salon de la Princesse, Hôtel de Soubise. An oval room on the upper-level, this salon was used by a princess of the Rohan-Soubise dynasty for entertaining. The walls dematerialize, punctuated by windows, doors, and large mirrors. Extensive amounts of gilt ornamentation cover the walls and frames openings. Themes to stress throughout the lecture include progress, building type, materials and technology. Henry Flitcroft, The Temple of Apollo, Stourhead, 1765 (Wiltshire, England). One of the best sources is Leland Roth’s Understanding Architecture: Its Elements, History, and Meaning, second edition (Westview Press, 2007). If you are looking for information on European architecture see Barry Bergdoll’s European Architecture 1750–1890 (Oxford University Press, 2000) and Sir John Summerson’s The Classical Language of Architecture, twentieth printing (MIT Press, 2001). For an explanation of materials, see Harley J. McKee’s Introduction to Early American Masonry (National Trust for Historic Preservation, 1973). This book provides an excellent overview of the tools used to prepare building materials and terminology. For British Architecture, see Sir John Summerson’s Architecture in Britain 1530–1830, ninth edition (Yale University Press, 1993). For American architectural history, I recommend a series of survey texts as well as sources that are more focused upon specific artists or structures. Leland Roth’s A Concise History of American Architecture (Harper & Row, Publishers, 1979) provides a standard chronological progression through North American architectural movements. Dell Upton’s Architecture in the United States (Oxford University Press, 1998) is divided into chapters that address American architecture through the lenses of community, nature, technology, money and art. For Stourhead see their webpage on the United Kingdom’s national trust site. For the United States Capitol building, see James D. and Georgiana W. Kornwolf’s Architecture and Town Planning in Colonial North America (Baltimore: Johns Hopkins University Press, 2002)—a wonderful text about colonial and early American architecture. Also see Henry Russell Hitchcock and William Seale’s Temples of Democracy: The State Capitols of the U.S.A. (New York: Harcourt Brace Jovanovich, 1976). For Schinkel’s Altes Museum, see Steven Moyano, “Quality vs. History: Schinkel’s Altes Museum and Prussian Arts Policy,” The Art Bulletin Vol. 72, No. 4 (December, 1990), 585–608; James J. Sheehan, Museums in the German Art World: From the End of the Old Regime to the Rise of Modernism (Oxford University Press, 2000); Karl Friedrich Schinkel, 1781–1841: The Drama of Architecture (Art Institute of Chicago, 1994). For the Gothic Revival, I am indebted to Chris Brooks’ The Gothic Revival (Phaidon, 1999); and Michael J. Lewis’ The Gothic Revival (Thames & Hudson, 2002). For the Grammar of Ornament see Carole A Hrvol Flores’ Owen Jones: Design, Ornament, Architecture, and Theory in an Age of Transition (Rizzoli, 2006); John Kresten Jespersen, “Originality and Jones,” The Grammar of Ornament of 1856,” Journal of Design History Vol. 21, No. 2 (Summer 2008), 143–53; and Stacey Sloboda’s “The Grammar of Ornament: Cosmopolitanism and Reform in British Design.” Journal of Design History Vol. 21, No. 3 (Autumn, 2008), 223–36. For the Skyscraper, I recommend Sarah Bradford Landau and Carl W. Condit’s Rise of the New York Skyscraper, 1865–1913 (Yale University Press, 1996); and Winston Weisman’s “A New View of Skyscraper History” in Rise of an American Architecture. (Metropolitan Museum of Art by Praeger Publishers, 1970). For Aesthetic Movement architecture, see Andrew Saint’s Richard Norman Shaw (Yale University Press, 2010); Jeffrey Karl Ochsner and Thomas C. Hubka, “H. H. Richardson: The Design of the William Watts Sherman House,” Journal of the Society of Architectural Historians, Vol. 51, No. 2 (June, 1992), 121–45; James F. O’Gorman’s “A Touch of Nash: The Williams Watts Sherman House and the Aesthetic Movement.” Nineteenth Century Vol. 19, No. 1 (1999), 53–9; and In Pursuit of Beauty: Americans and the Aesthetic Movement (Metropolitan Museum of Art, 1986). For Ecole des Beaux Arts architecture see Christopher Mead, “Urban Contingency and the Problem of Representation in Second Empire Paris,” Journal of the Society of Architectural Historians Vol. 54, No. 2 (June, 1995), 138–74. The layout of this lecture is designed to underscore the international and intercontinental spread of architectural ideas. In most instances, I give two examples to illustrate a particular stylistic movement—one European and one American. Optional works are indented underneath to supplement certain topics. I have also included asides about materials and other topics, which can be useful. McKim, Mead, and White, American Safe Deposit Company Building, (New York City, 1882–4). Begun in the second half of the eighteenth century and lasting through the early nineteenth century, the Enlightenment did much to affect the path of architecture. Though not a single unified movement, it was founded on the belief in progress and in the power of reason. Recent achievements in science encouraged the notion that, through the acquisition of knowledge and the application of reason social, intellectual, and moral reforms could be affected. The impact of the Enlightenment on the arts took various forms. Some artists paid homage to science, others studied the classical past. The later impacts architecture more acutely. By 1750, there was a growing discontent with the gaudy Baroque and Rococo architecture highlighted above. It came under fire for being dishonest, meaning that its sculptural, undulating walls and overzealous ornamentation deceptively hid the building’s supporting construction. Critics thought that these features placed the emphasis in the wrong places and architecture required a much needed return to its primitive origins. This viewpoint was demonstrated in the frontispiece of the second edition of Essai sur l’architecture by Jesuit priest and amateur aesthetician Marc-Antoine Laugier (1713–69). The engraved frontispiece of Essai sur l’architecture depicts a classical female figure as the Muse of Architecture, holding a compass, a right angle and reclining on an entablature. The image also includes the Scamozzi Ionic capital (Scamozzi Ionic capitals flare out at the corners when the two sides come together). This Muse directs an infant to a primitive hut, humanity’s first built structure that represents pure, honest architecture. Built of wood—both living trees and cut—the space was created using a limited number of elements: posts (the verticals), lintels or beams (the horizontals), and gabled roof. All of these elements are not decorated. This image served as a rallying point to galvanize people to return to a perceivably purer architecture. It should be stated here that Laugier and his supporters did not feel that the only structures that should be built were primitive wooden huts. Instead, they promoted the idea that if a historical source was emulated, it should be from a culture that practiced pure architecture. The older the civilization, the purer architecture they created. Using this logic, Greek architecture was superior to Roman, as Greek civilization was older. One publication that did the most to spread an awareness of Greek architecture was The Antiquities of Athens: Measured and Delineated by English architects and antiquarians James Stuart and Nicholas Revett. Conceived during the Enlightenment, when there was interest in ancient cultures, the work was subsidized and published by the Society of Dilettanti (an English group of men who had all partook in the Grand Tour. Sir Joshua Reynolds was a member of the group who painted several portraits of its members). This text is noteworthy for containing the first meticulously measured drawings of ancient Greek architecture, giving the Western world access to their natural architectural perfection. To make the text as accurate as possible, Stuart and Revett spent four years (1751–5) documenting architectural monuments in and around Athens before returning to England to begin the publishing process. Although it was intended to be the first text of its kind, the drawn out publishing process allowed for a Frenchman, Julien-David Le Roy to produce Les Ruines des plus beaux monuments de la Grèce (Paris, 1758) five years before the first volume of The Antiquities of Athens appeared. Despite publication delays, and then its gradual release, The Antiquities of Athens’ influence was international and it became a manual (historian James F. O’Gorman uses the word “Bible”) for the “Greek Revival” across Europe as well as in North America, c. 1810s–1840s. An illustration from Volume One of the text depicts the Choragic Monument of Lysicrates. Located near the acropolis, this monument was erected around 334 BCE to commemorate an athletic or choral victory. This circular structure is thirteen feet high, made of marble, and around the exterior are six engaged Corinthian columns—some of the earliest of that type. Now lost is a tripod trophy that at one point surmounted the monument. A visual and ideological counterpoint to the pursuit of a more pure architectural source is the picturesque landscape garden Stourhead located in Wiltshire, England, the vision of banker Sir Henry Hoare. Designed over decades, Stourhead’s vistas were completely constructed—earth was moved, a lake was formed by damming a local river, and flora was planted. Hoare aimed to make mimic the painted landscapes found in the paintings of French Baroque painters Claude Lorrain and Nicholas Poussin. Indeed, Hoare had collected Lorrain’s Coast View of Delos with Aeneas (1672), which influenced the designs. For example, the garden included bridges and a building with a dome, imitating the Pantheon in Rome, motifs found in Lorrain’s paintings. The winding path through the garden began and ended at the house, leading one around the irregular lake that forms the garden’s centerpiece. Along the way, one was supposed to stop at certain points to admire views and pavilions constructed in differing architectural styles. 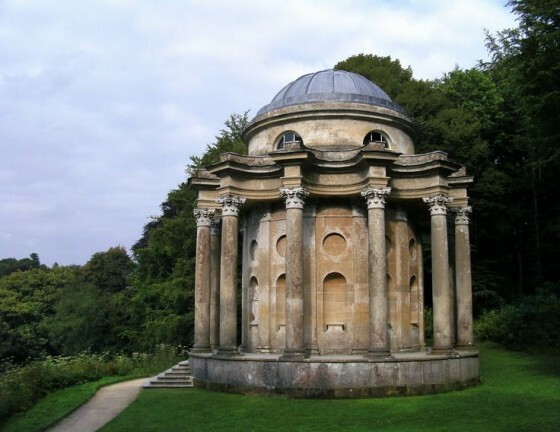 Palladian architect Henry Flitcroft was commissioned to construct several pavilions for Stourhead: the aforementioned Pantheon (constructed between 1753–4), the Temple of Apollo (constructed in 1765), and the triangular 160-foot brick structure King Alfred’s Tower (designed 1765, constructed between 1769-72)—the top of which can be reach through an internal spiral staircase. In 1765, the Bristol Cross was moved from its original Bristol location to Hoare’s park. Over the centuries there has been debate among historians as to how the Virgilian inscriptions on the pavilions should be interpreted, and how that affects in the viewer’s experience in the garden. Politically, the full embodiment of Enlightenment ideals was reached during the American and French Revolutions that took place at the end of the eighteenth century and the early part of the nineteenth century. The United States Capitol (c. 1793–1828, 1851–7, and 1856–63) in Washington D.C. became a beacon to Enlightenment ideas, adhering to the Classical spirit in its architecture’s revolutionary Neoclassical style. The federal building was envisioned as a seventeen-room brick building that would house the legislative branch of government. The fact that the U.S. Capitol was originally envisioned as a brick building may come as a surprise for students, who by this time are used to seeing European architecture constructed of fine stone. At the turn of the nineteenth century, American architects and builders were still uncomfortable and quite untrained in using this material. The lack of confidence architects and builders had for building stone was balanced by their assurance in using brick. Brick’s flexible recipe, permanence, and skill requirement allowed it to used across American in building construction. On the eastern seaboard, it was a material that that been in use since 1618 (the first brick building was the Fourth Jamestown Church—Jamestown was founded in 1607). As time progressed, other functions were added to the Capitol, such as Washington’s tomb and setting aside a space for the Supreme Court. In initial submissions, American gentlemen architects/builders failed to create adequate elegant and monumental forms that would define the nation’s new building type. President Washington called them ‘dull.’ Ultimately, the chosen design was a synthesis of competition submissions, which had referenced many aspects of other state houses, namely: a portico, a dome, a central public space, and the two houses opposite one another. Despite having many different creators (William Thornton, B. H. Latrobe, Charles Bulfinch and Thomas U. Walter—who were a mixture of professional and gentlemen architects), the Capitol’s various parts are united in the Neoclassical style, with the focal point being Walter’s dome (1856–63), modeled after the Pantheon. Construction of the Capitol pushed American builders out of their material comfort zones. Originally proposed as a brick structure, it was decided that ashlar masonry should be used for the exterior. For the vaulting, Thomas Jefferson wanted to use wood, but Latrobe pushed for masonry. Decades later, builders were pushed to their technological limits using a new material—iron, both cast and wrought—to create the Capitol’s famous dome. Nineteenth century architecture is memorable for its quick succession of historical revival styles, including the Greek Revival, the Gothic Revival, and the Queen Anne Style (a.k.a. the Aesthetic Movement), as well as introducing some major architectural publications and new building types. I hope to give a sense of the complexity of the nineteenth century architectural situation by highlighting select architectural examples, architectural texts, and new building types. The facade of Karl Friedrich Schinkel’s Altes Museum in Berlin is a prime example of Greek Revival architecture. The museum is a large box with eighteen fluted Ionic columns in front, surmounted by a smaller box. The building’s sheer breadth—it takes up almost the whole width of the northern end of the Lustgarten (Pleasure Garden)—and its façade, distilled to vertical and strong horizontal elements (arches are a feature synonymous with Roman architecture), are the more primitive/pure Greek architectural characteristics to which Schinkel alluded. The most direct visual source would be the Athenian stoa poikile, the ancient covered colonnade in the agora. This building did much to revitalize the heart of the city. First, by placing the museum at the north end of the Pleasure Garden, Schinkel inevitably elevated the art museum’s position in society because it took its place among three other important buildings: the Royal Palace, the Cathedral, and the Arsenal. Second, Schinkel carefully controlled the viewing experience of this building. Around 1830, one approached the Altes Museum from Berlin’s main boulevard Unter den Linden (“Under the Linden Trees”—the boulevard was lined with them). Down the street, the Royal Palace anchors the viewer’s vista. As one approached the palace the trees would frame a view of the Cathedral. Upon crossing the bridge and entering the southern end of the Pleasure Garden, the view of the Altes Museum would finally be visible. Internally, Schinkel forcefully argued for the rotunda, a space he felt would prepare visitors to experience the building and view works of art. Schinkel’s Altes Museum façade conveyed his understanding of the principles underlying the pure linear forms of Greek architecture. Other architects opted for a more direct quotation of Greek architecture. In the United States, a fine example of Greek Revival architecture is William Strickland’s Tennessee State Capitol (Nashville, 1845–9). Well-trained (Strickland was trained by B. Henry Latrobe, whom we met above with the U.S. Capitol) and well-traveled (Strickland went to Europe in 1838, traveling through England, France, Italy and Germany. Images from his European sketchbook have been made available online at the Tennessee Virtual Archive “William Strickland Sketchbook”. ), Strickland demonstrated his broad working knowledge of historic architectural sources in the Tennessee State Capitol. In the Capitol, Strickland referenced a different order (Doric, Ionic, Corinthian) in each main section of the building. Working from the ground upwards, the Capitol had a Doric basement, Ionic porticos, and a Corinthian tower. The Erechtheum (the Acropolis, Athens, Greece) inspired the Ionic porticos, and Strickland used plates of the Choragic Monument of Lysicrates found in The Antiquities of Athens as inspiration for the lantern for his building. Strickland modified the forms of the ancient original with windows to suit modern needs. The Gothic Revival began in Britain and spread internationally and across continents. Arguably the greatest monument to the Gothic Revival is the New Palace of Westminster, better known as the Houses of Parliament (London, 1835–68). Harmony/Fitness: It was believed that there exists a connection between culture and architectural expression. The Gothic style surfaced during the medieval ages. The architecture produced was viewed as being perfectly in harmony to its needs. During the Gothic Revival, it was hoped that if buildings were constructed in that earlier style that it might resurrect some of the sentiments and the harmony perceived as missing from modern society. Nationalism/Patriotism: At this time it was believed that each culture creates its own distinct style that suits its culture and climate. In the nineteenth century, Gothic architecture was perceived as being an indigenous English style, it would be only natural to draw upon England’s own architectural heritage and not an imported style from the southern European continent. Neoclassical architectural style would further be unsuited to England as it is an architecture produced for its milder Mediterranean climate and would be unsuited to the weather conditions of the north. Function/Honesty: Gothic architecture was viewed as being an honest form of architecture, in which everything included contributed to its construction. Gothic ornament was judiciously placed to enrich and accent structural lines. In the end it was decided that architects submit designs in either the Gothic or Elizabethan style. Architect Charles Barry (1795–1860), best known for his classical and Italianate designs, submitted the winning design. Because of his more classical specialty, he employed the talents of A.W.N. Pugin, the vociferous Gothic revivalist mentioned above. The workload between the two men was neatly divided, Barry designed space and structure and Pugin designed the ornament and the interiors. Barry’s design was successful for multiple reasons. First, the Houses of Parliament was built on the site of the Old Palace of Westminster and successfully integrated the surviving structures (Westminster Hall and St. Stephen’s Chapel) into the new building complex. Second, Barry created a harmonious—though slightly asymmetrical picturesque—exterior by balancing the horizontal and vertical lines. The exterior’s recognizable sand-colored limestone came from Anston Quarry in Yorkshire. This particular stone was selected for its cost effectiveness and because it is a sedimentary rock, it could be easily manipulated. In the twentieth century, parts of the building in which the stone had eroded significantly were replaced with a honey-colored limestone from Medwells Quarry in Rutland. Third, Barry’s classical training strongly influenced his logical arrangement of rooms and courtyards, which he based around the classical system of repeating modules. This can best be appreciated by viewing a floorplan of the structure. Four branches of the building radiate out in the cardinal directions: north, south, east and west from a centrally located octagonal lobby. 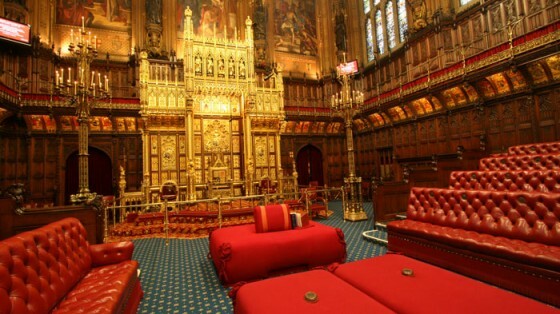 Barry placed the Throne room (located in the House of Lords), the House of Lords, and the House of Commons in line with one another, a subtle underscoring of the line of power in the English government. Pugin designs for the interiors included furniture, tiles, stained glass, and metal work. His most sumptuous decoration appears in the House of Lords, where seemingly every square inch is encrusted with medieval-inspired decoration. Switching to the United States, architects such as Richard Upjohn’s used Pugin’s books as a manual to design Gothic Revival buildings like Trinity Church (New York City, NY, 1839–46). Trinity Church was one of the most noteworthy commissions executed in America in the Gothic Revival style. In Trinity Church, one sees a shift occurring in American taste from the Classically inspired to the Gothic and Picturesque. Trinity Church espoused the ideals from leaders of the English Gothic Revival, and Upjohn based its design on an illustration of an “ideal church” from Pugin’s True Principles. Upjohn tweaked several aspects of Pugin’s design to accommodate American building methods and the site such as the vaulting, the pitch of the roof, and the chancel. Longitudinal in plan and made of brownstone masonry, the church was not as elaborately decorated as it could have been. Owen Jones’ Grammar of Ornament (London, 1856) is a design manual that has inspired countless generations of architects and designers. Conceived during era of English design reform, the Grammar of Ornament became Jones’ aesthetic treatise. The Grammar of Ornament contains Jones’ 37 propositions (principles) of design, nineteen chapters dedicated to historical types of ornament, and a single chapter dedicated to the common denominator behind all ornament—nature appeared in 100 chromolithographed plates, in which there were 1,000 cropped illustrations ornament, which removed any hint of an original context. The quality of the lithographic plates is one factor that made the Grammar of Ornament famous. The content of the Grammar of Ornament appealed to architects, designers, and reform design thinkers, as John Kresten Jespersen writes, “for a century (after its publication), almost every architect’s office had a copy of the Grammar of Ornament.” The intent of this publication was not to give architects, ornamentalists and designers a template from which to copy in their work, rather to allow individuals to absorb lessons from the past and apply this information to the ornament that would suit modern life. Significant Height: (more vertical than horizontal) This building type was created to suit the need for increased building space in major urban areas, the two most important of which were New York City and Chicago. The scarcity and the cost of land in these and other urban areas forced architects to build in only one direction—upwards. Passenger Elevators: As human beings are usually opposed to walk up more that five flights of stairs, the incorporation of passenger elevators were a blessing. Elevators made each and every floor just as easily accessible and rentable, enabling building to be higher. Metal Frame: Iron’s popularity increased in the middle of the nineteenth century as architects discovered its potential in building construction. Iron was used two ways in architecture: cast and wrought. Cast iron was a strong metal, capable of carrying great weights by compression. Major flaws of cast iron included its brittleness in terms of ductility as well as the irregularity of its compositional makeup. Wrought iron was not as strong as cast iron, but had an advantage in that it could assume any number of shapes. The combination of cast iron posts and more extensive wrought beams revolutionized the way in which architects envisioned structure and space. In short, iron allowed architects to build taller and span wider distances than ever before. In other words, advancements made in skyscraper height are closely tied to advancements in building technologies that supported them. Beginning in the 1880s, the more expensive and specialized product, steel began to replace iron as the preferred structural building material (as it contained the same/or increased strength of cast iron and the ductility of wrought iron). In the 1880’s, the first architects made the switch from iron to steel. The earliest example of a skyscraper may surprise you. Noted authorities Weisman and Condit concur that Gilman, Kendall & Post’s Equitable Life Assurance Company Building (New York City, 1868–70; destroyed) is the first skyscraper, since it was the first building that was designed and built containing all three of the aforementioned skyscraper features. Our twenty-first-century eyes, accustomed to seeing skyscrapers as enormous structures built of a curtain of metal and glass, would likely not recognize Equitable Life Assurance Company Building as an early descendant. This lost structure (for which no plans survive) is known only through images and building records. At 130 feet in height, this building was not significantly taller than surrounding commercial buildings. Yet, the conscious incorporation of the elevator transformed commercial architecture, as it allowed all eight stories to be easily reached, and therefore easily rentable. Architects cloaked the Equitable’s iron skeleton in the only way they knew how: with a grey-granite masonry, arranged with tiers—separated by entablatures—and capped with a hipped roof. In images the structure has a very Second Empire appearance, a style believed to be chosen for its ability, given Haussmann’s opulent Paris, to signify stability and prosperity. From the very beginning, skyscrapers served as office buildings. Throughout the later nineteenth century architects worked to give a characteristic facade to the skyscraper. Two major trends emerged: “wild work” and the Italian Renaissance palace, which can easily be illustrated with noteworthy period examples. In Chicago, William LeBaron Jenney’s Home Insurance Building, c. 1885 is an example of “wild work.” “Wild work” was a descriptor used by eminent late-nineteenth century architectural critic Montgomery Schuyler to refer to facades like this one. What Schuyler found wild, or mind-boggling, about this building was the ways in which the horizontal and vertical lines were constantly interrupted. The Home Insurance Building is also noteworthy as it was the first building to use steel construction. In New York City, the firm of McKim, Mead, and White gravitated towards a three-part skyscraper façade, evident in the American Safe Deposit Company Building, (1882–4). This building’s three parts (basement, shaft, and third tier of space at the top) are neatly defined. Three-part façade divisions like this inspired critic Montgomery Schuyler (who we just met above) in 1899 to liken such surfaces to the three parts of a classical column: base, shaft, and capital. Over the years, Schuyler’s metaphor has been applied to, and used to explain numerous facades, and has mutated to become the accepted explanation, but is wrong. This type of façade was inspired by Italian Renaissance Palaces such as the tripartite façade of the fourteenth/fifteenth century Palazzo Davanzati, which likewise has a basement, a shaft, and a third tier of space at the top–complete with an order in the loggia. The tripartite formula became a popular pattern used by architects across the nation such as Daniel H. Burnham & Company’s Flatiron Building (New York City, 1901–3). Even two-decades after this façade pattern had been first implemented, it had yet to fall out of style. Aesthetic Movement architecture (which is usually called the Queen Anne Style) began in England in the 1860s and then came to America in the 1870s. It was largely used as a secular architectural style, which some critics considered to be a major flaw (since it did not transition into sacred commissions). This style was characterized by its freedom, especially in color, picturesque, and asymmetrical design, and complex ornament. One of its greatest practitioners was R. Norman Shaw and one of the most famous buildings was the New Zealand Chambers Building (London, 1871–3; destroyed), an office building. Shaw used architectural elements to break up flat surfaces and shatter the light across the exterior of this building. The tendency to create highly textured facades would become a feature associated with Aesthetic Movement architecture on both sides of the Atlantic. H. Richardson’s William Watts Sherman House (Newport, Rhode Island, 1874–6 and numerous additions) was one of America’s earliest Aesthetic Movement architectural works. Most Americans would be introduced to the other aspects of the Aesthetic Movement at the Centennial Exposition in 1876. The Sherman Residence was a combination of established and innovative architectural features. The established features included the asymmetry (attempting to break the box) of early nineteenth century homes. The innovative feature was a new form of space—the living hall. The Sherman House’s living hall stretched the depth of the building and contained a hearth and a massive staircase. A variety of rooms (public, private, servant quarters) radiated off this living hall which produced an irregular floorplan. The irregularity of the floor plan was expressed in the asymmetry of the façade’s exterior. Within the gables Richardson created the silhouette of a saltbox house. The inclusion of this profile is noteworthy as Richardson revived a distinctive aspect of American colonial architecture. Additionally, on the facade, Richardson varied surface texture, allowing light to break apart on the surface, causing a scintillating effect. Inside, a selection of decorative objects—such as art glass—further underscored the philosophy of the Aesthetic Movement. Charles Garnier’s Paris Opera House (Paris, 1862–75) is a building about spectacle. A grand structure, it was one of many that fit into Baron Haussmann’s revitalization of urban Paris. The Opera’s spectacle begins with its location. Built on its own island, it is approachable from several streets and the major Avenue de l’Opera, terminating in its own Place (a plaza or square). Though one may be distracted from the shear amount of ornament on the façade, the exterior overlooking the Place can be distilled into a podium-like arcaded base, atop which Garnier placed a colonnade. This colonnade was a recognizable variation of the two-part façade that Bramante’s House of Raphael popularized back in the Italian Renaissance, now quite popular in Paris. Garnier proceeded to adorn this classical façade with sculptural accents for which he employed some of the finest artistic talents in Paris—such as Jean-Baptiste Carpeaux, who sculpted The Dance. The building’s entrances were designed to accommodate the societal needs of different opera-goers, from the Emperor to the bourgeois. Once inside, the spaces Garnier created is the mark of the classical training regimen of the Ecole des Beaux Arts, the institution that taught Garnier. The spacious lobbies, wide staircases, and sumptuous veneered surfaces served as dramatic platforms and backdrops to an environment designed for people to see and be seen. Underneath these elaborate surfaces, the Opera’s structure made use of the latest advancements in iron construction. Inside and out, this building makes use of Classical sources. Although there were almost 200 structures built for the World’s Columbian Exposition (hereafter WCE—Chicago, 1891–3), the fair became a dialectic of two courses in American architecture, Ecole des Beaux Arts classicism (evident in the architecture of the Court of Honor) and Picturesque/Aesthetic Movement (evident in the architecture surrounding the Lagoon). In America, leading up to the WCE, picturesque traditions such as the Aesthetic Movement—with their colored, asymmetrical, and scintillating surfaces—were popular. For example, Louis Sullivan’s predominantly red and gold Transportation Building extended this visual tradition to the WCE. In contrast, the majority of the main fair structures were constructed in the tradition taught at the Ecole des Beaux Arts in Paris. These fair buildings were unified by their coloring (white), classically inspired architectural elements, unified cornice line (65’), and axial symmetry. Beaux Arts classicism had such an effect on fairgoers that it would become the favored architectural style in America for the next several decades. The differences between these two architectural vogues were further underscored in the WCE’s landscaped environments, designed by landscape architect Frederick Law Olmsted. Olmsted’s landscape architecture for the Court of Honor was a well proportioned symmetrical basin in perfect tandem with the balanced (all buildings had a 65’ cornice line) and symmetrical Ecole des Beaux Arts classicism surrounding it. For the lagoon area, Olmsted designed an irregularly shaped lagoon, in the middle of which was a wooded island with picturesque trails. Charles Barry and A.W.N. Pugin, The House of Lords, Houses of Parliament (London, 1835–68). By doing this type of review, you get to hear the student’s logic. Also, you will know if there are any ideas that you need to cover again or stress in your next lecture.